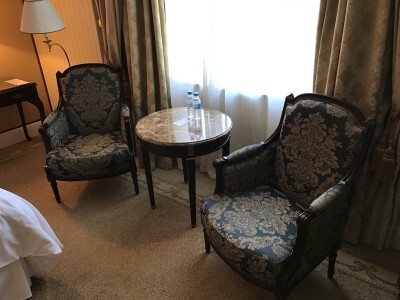 Here is my review of The Westin Palace hotel, my second stop in Madrid. 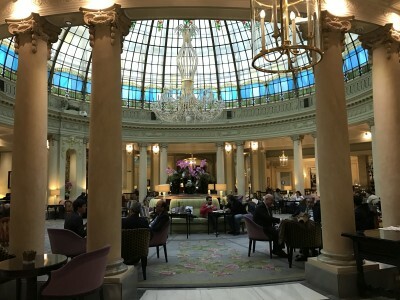 The Westin Palace was a short taxi ride from the Gran Melia Palacio de los Duques (my review of that lovely hotel is here) and is located on the other end of the main shopping street in Madrid at the Fuento de Neptuno. My stay was not organised by Westin / Starwood which is why I didn’t get a tour of the hotel and can only discuss my own room. I didn’t have breakfast included and, given my continuing cough, decided to rather have a lie in rather than go hunting for food in the morning. The entrance hall is quite impressive and sets you back in time. It looks like even though the hotel has been refurbished in its 100 years of existing, the style has been preserved. It didn’t start well. When I arrived the doorman decided not to open the door for me and no one came to offer to help me with my luggage. I went up to one of the check in desks and had to wait about a minute until I was even greeted. I can understand that some things might be more important than checking in a guest, however a ‘welcome, I will be with you in a second’ would have been nice. The booked category was a Deluxe with a king bed and I was upgraded to a Premium View room on the back of my Starwood Gold status. My first impression was that everything was little bit too yellow and looked kind of dated. The TV was on top of the minibar and looked out of place. It did however have English, Spanish and German TV. 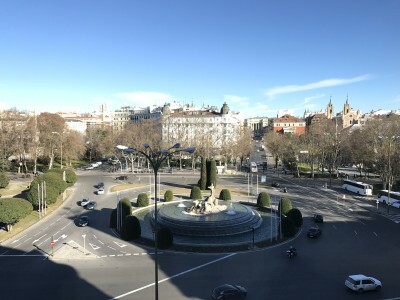 The view from my window was onto the Fuento de Neptuno with a fairly busy roundabout. Though I was on the third floor and therefore quite close to the street, noise was limited. 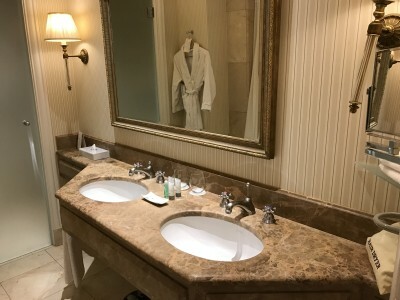 The bathroom had two sinks with brownish marble. Toiletries were the standard Westin brand. The shower was inside the bathtub and had good water pressure. 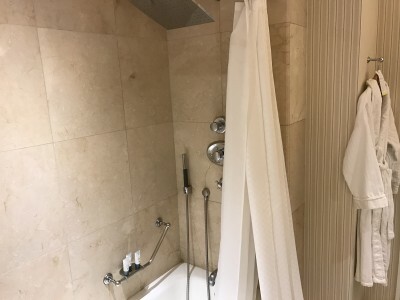 The shower curtain was slightly annoying as the inside layer kept moving towards the water stream – and let’s face it, it’s also not very pretty. There was neither a coffee machine nor a kettle in the room! Instead I found a little note saying that I can order one coffee or tea per person per day for free. I called Service Express and got the tray below delivered to my room. This is a nice service, but I like to be more in control of my coffee intake! This is a picture of La Rotonda, the hotel’s restaurant. It is the focal point of the entire hotel and undeniably impressive. The globe and chandelier are very pretty and if I had been feeling better I would have loved to enjoy a drink here. There was a rather smart sitting area outside the elevator which caught my eye. Outside the spa area with gym (sorry no picture as too many people were working out and I just couldn’t walk in to take a picture) and sauna (a tiny sauna room inside the changing room) is a balcony where you can order food and drinks. To give you a better impression of what you can expect, here is a short YouTube video of The Westin Palace in Madrid. You can subscribe to our YouTube channel via this page – this is the same link to visit if the video does not automatically appear below. 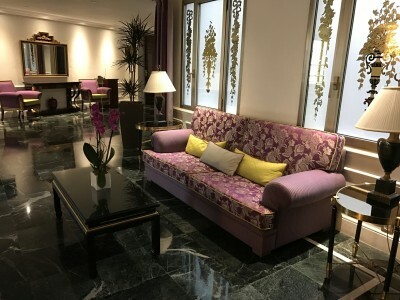 The Westin Palace in Madrid didn’t fully convince me, especially after my stay at the Gran Meliá Palacio de los Duques the previous night. In general I love it when hotels preserve their style from former decades. 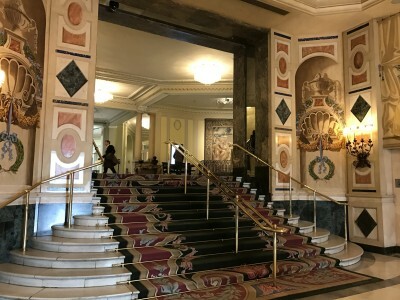 The Westin Palace certainly has an impressive entrance hall and a gorgeous restaurant, but my room was rather disappointing. It was dated, the bathroom was boring and the furniture looked out of place and randomly put together. Having butler service instead of a coffee machine and/or kettle might be a plus for some people, but I would have appreciated at least a kettle to make a cup of (herbal) tea. I would go back to have a drink in the beautiful La Rotonda, but I wouldn’t necessaily choose to stay at The Westin Palace overnight again. In terms of cost, I used 12,000 Starwood Preferred Guest points. Cash rates for a standard room seem to vary between roughly €215 and €285 per night. Given Rob’s valuation of 1.5p for a SPG point, this is a decent place to redeem. The Westin Palace Madrid website is here if you want to find out more. Is a 35% bonus on hotel point transfers to Avios a good deal? Not sure about appeal of Madrid if you do not need to be there on business. Yes. That’s what we did. Without the cafe con leche :-). I prefer Madrid to Barcelona – its a real working city , not just tourists. Strange. It’s one of my favourite cities in Spain. Brilliant place to chill, eat and drink gin. I’m glad to hear that given the first post. We’re heading there this weekend (first time). Hopefully the weather forecast changes as it’s currently showing heavy rain. 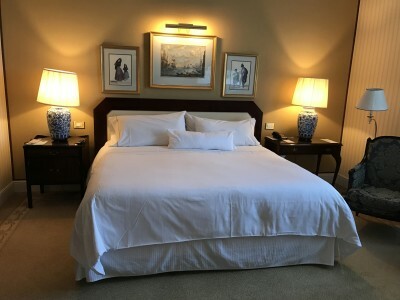 Great city – we went for 5 days last March – Prado, the Palace, the Monasterio de las Descalzas Reales is stunning too, the Thyssen-Bornemisza museum, San Miguel market is fun – just general walking – lovely city. Unless you’re hugely into your art, for the Prado I’d recommend the “50 masterpieces” mini guide. €5 from the gift shops inside the museum, it takes you on a tour from Bosch’s earthly pleasures to Goya’s Black Paintings in about 3 hours. You’re probably skipping 200 masterpieces that 95% of the world’s galleries would kill for but made the whole experience manageable for us. Hah! I must add about paying business-level rates for Madrid central hotels. That’s the problem with it as a leisure destination. For the authentic experience, there are quite a few large cities in Spain. You’ve really missed something. It’s a great place! I must admit, I’ve never ‘got it’ either. Far prefer Seville or Barcelona (or Lisbon if popping next door). I guess this is a perfect case of horses for courses. Madrid is a fantastic city, stuffed with culture and fab eateries & bars. Whereas one of your favourites, Dubai, is a bore. I was last in that hotel on Sept 11, 2001. The room looks exactly the same. Impressive that you remember the exact date from such a long time ago…. Not really, in this case. I know where I slept that night. I flew from Scotland to Belfast that night. The airport was dead. There were 3 people on the flight, thus plenty were fearful to fly, like that route was a prime target! I recall peoples bebuddlement when I told them during the day that I was flying that night. Crazy. Don’t start me on about my wife, holidays in Thailand x2 and bird flu/ sars! put it this way: both times I had to beat her senseless! One of my former colleagues was in a lawyer’s office in NYC that morning with a few other senior aviation execs, discussing setting up a new airline! They watched the situation live from the office window. On my recent trip to Madrid we went to a bar that only serves gin and tonic. It was absolutely packed at 5pm on a Saturday afternoon! My family and I went in Feb 15 and had a lovely time, stayed at the IC. Chilled and casual city. I noticed this hotel after walking in the park and fancied staying on our next trip as the IC is quite a walk from anything. Thanks for the review. If I remember, we sat outside a bar next to the Mecardo San Miguel in the Febuary sun having a beer, just after eating a load of oysters and calamari, yeah nice. I also really like the city, went there in June last year, weather was perfect at the time, for me it is a very nice city to relax and strolling around. Also stayed at the IC, although a bit far from some of the main attractions, but it was near the public transportation and I did not mind the walk either. Along with the paintings hung askew – all to the same side.. I know it’s not new year open forum but in the bigger scheme of things I’m no longer convinced hotel reviews have a place on HFP. This is not a criticism of the reviews themselves, far from it, but rather I would prefer that the space devoted to reviews were given over to much more potentially useful posts such as more bits posts with issues in brief. There are many places to find multiple reviews of each hotel reviewed on HFP albeit many (but not all) lack the HFP detail. I am still in favour of lounge reviews though as on HFP these usually come with useful info on access tailored to the cards and schemes we may hold being UK based. I still like idea of HFP being a single source of reference for all UK lounges once completed. Likewise, I think lounge reviews for the major international hubs we frequently use are also very useful. Hotel reviews probably represent 20 articles a year out of 1,100 – I don’t think you’re drowning in them. This one is admittedly slightly outside the norm because we tend to focus on a) new big-brand hotels, b) refurbished big-brand hotels or c) airport big-brand hotels, but Anika needed a bed for the night so I popped her in there! There is also an underlying Google benefit. Knocking out a news article takes about half the time of a review so they are not there to fill space. They are there to help with the ‘spending’ part of ‘earning and spending points’. 85% of the site is still focused on the former. I don’t see how 20 out of 1,100 articles counts as ‘a lot’. Back at the start we were doing 1 article per day so 20 / 363 articles as hotel reviews would have been quite heavy. 20 out of 1,100 is just rounding. 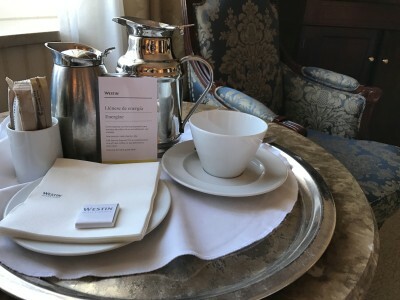 There is one more to go from this trip and then that’s it for the immediate future – I won’t be covering the (non-chain) ski hotel we are in next week or the Crowne Plaza Salzburg again as I did that last year. We are also skipping the Radisson in Hamburg where Anika is going. If you’re lucky you won’t see any more hotel reviews until the IC Hong Kong in late April! At which point, of course, there will be a glut of Asian properties – IC Hong Kong, IC ANA Tokyo, Conrad Tokyo, Ritz-Carlton Kyoto, Park Hyatt Beijing ….. Rob – unlike the others who simply appear unable to ignore such reviews (seems petty and illogical to rattle on, wasting everyone’s time, when simply ignoring such reviews would solve everything), please feel free to ignore their unconstructive feedback. Always happy to listen to feedback, and I’m usually willing to justify my reasoning on any particular issue. Obviously at the end of the day we make the editorial call though. Thanks Rob, happy with your facts and feedback on this. It just ‘felt’ like the number of hotel reviews had increased of late. To be fair, there have been hotel reviews I have found useful too. These have tended to be those with a particular slant that go beyond a straightforward review. For example, new openings with lower redemption rates (btw, see Hilton Greenwich), and Hilton Syon Park and St Georges Park. Love the reviews Rob. For me, this is an economical way to “dip-test” these hotels without spending a lot(except my time reading the reviews!) and then pick the best hotel based on such(and other TripAdvisor etc) reviews when I need to go to such places. I really like the hotel reviews! I’m bored rigid by all Tesco clubcard posts but I know it’s horses for courses so I don’t moan about them – and yes I do get that it’s a points blog. I also love Madrid but not impressed by the look of this Westin. Much more impressed by the last hotel. I’d give the last one a try on the basis of that review. The hotel seems rather average. 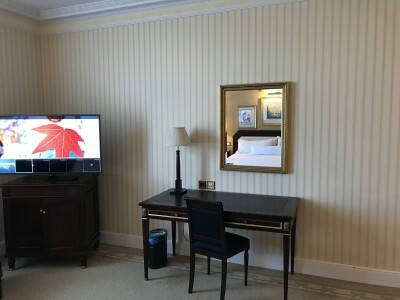 To say “The Westin Palace in Madrid didn’t fully convince me” doesn’t really sit well with ” this is a decent place to redeem”. Getting a good pence per SPG point rate is not the same as it being good value for money / points. 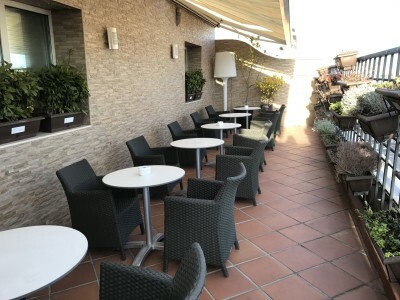 Unless economic theory has ceased to function, ‘the market’ has decided that the hotel can charge that price, based on a factor of location / quality / service compared to other competing hotels in Madrid and so the comparison is valid! If no-one felt it was worth €250 a night compared to the alternatives then it would be empty. This is weird. A very, very small % of people are getting this problem. I’ve had a grand total of 3 people mention it in 4 days. It doesn’t happen for me, on either of my computers (in Chrome) or on an iPad. It also doesn’t happen to Anika via Firefox. Not sure exactly what the problem is. They want to keep the ad up until the 14th – and frankly it pays well given that they let me put it down at the bottom – but I will re-assess if it continues to cause problems. The room decor does look hideous – designed to avoid offending octagenarian guests. I did have a couple of personal negatives to relate about this review when I read it this morning – but giving slightly negative (albeit constructive) feedback is not always a good idea so I refrained. Particularly after Ibiza 🙂 where I also had a few misgivings. Better to give the young colt a chance to run. You develop over time. criticise Anika and she has to take it on the chin, perhaps unfairly, in any case why should anybody writing a review get snide remarks/ criticism written about their report just because AN Other doesn’t agree with them? OK: I will say: nobody UK particularly wants to know about a reviewer having a cough or any other medical condition. Unfair I think. If she hadn’t mentioned it people would be asking why on earth she didn’t review the breakfast.